Home study am i sinning Sedition in the Church; Is God Pleased with Division? I am so glad you decided to join us as we focus on the sin of sedition, also known as division and dissension, in the church not the world. Yes, some of the children of God cause and / or contribute to sedition / division / dissension in the body of Christ. Other King James versions usage: AKJV, KJC and UKJV continued with ‘seditions’. RKJNT and NKJV replace seditions with ‘dissensions‘. The MKJV and KJ2K use ‘divisions‘. MSTC version used ‘sedition‘. Romans 16:17-19 Brothers and sisters, I urge you to watch out for those people who create divisions and who make others fall away from the Christian faith by teaching doctrine that is not the same as you have learned. Stay away from them. 18 People like these are not serving Christ our Lord. They are serving their own desires. By their smooth talk and flattering words they deceive unsuspecting people. Paul expressed and showed deep concern for the Corinthians, visiting them three times, but needed to be firm with them; read 2 Corinthians 3:1-10. 1 Corinthians 3:3-4 because you are not yet spiritual. You are jealous and argue with each other. This proves that you are not spiritual and that you are acting like the people of this world. Please read 1 Corinthians 3:1-17 and let me know what God shows you. Sedition – deliberate provoking or stirring up of discontent (unhappiness), a resistance, revolt, or rebellion against authority. Implies conduct leading to or inciting commotion (confusion) or resistance to authority but without overt (open to view) acts of violence or betrayal; a serious breach of allegiance. Used generally in the sense of rebellion; discord; insurrection (an act or instance of open rebellion against authority). Dissension – Disagreement in opinion, usually of a violent character, producing warm debates or angry words; contention in words; partisan and contentious divisions; breach of friendship and union; strife; discord; quarrel. 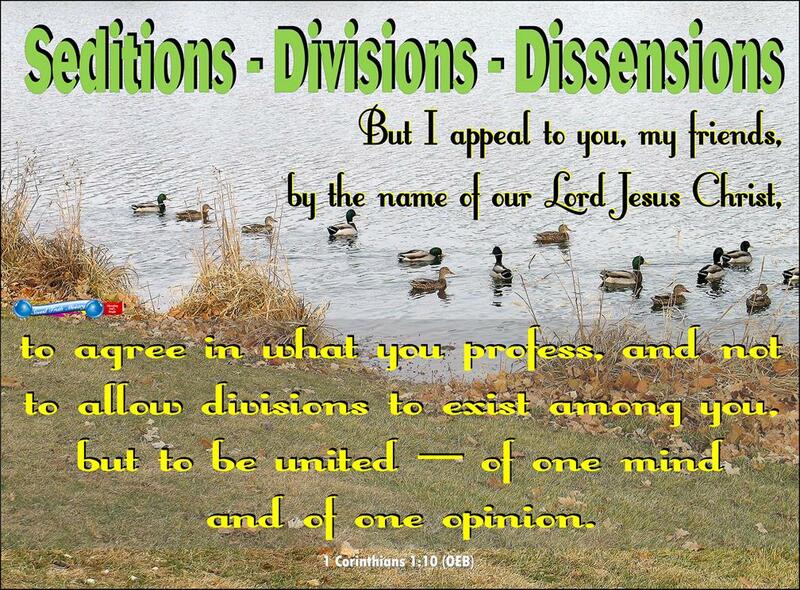 Division – Disunion; difference in opinion or feeling; discord; variance; alienation. Example: There was a division among the people. John 7:43. Contention – Strife in words; controversy; altercation quarrel; dispute; as, a bone of contention. Ordinarily, however, these words denote a struggle arising from bad passions. In that case, strife usually springs from a quarrelsome temper, and contention from, a selfish spirit which seeks its own aggrandizement, or is fearful lest others should obtain too such. Strife has more reference to the manner than to the object of a struggle, while contention takes more account of the end to be gained. Strife – Exertion or contention for superiority; contest of emulation, either by intellectual or physical efforts. 2 If so […then], make me very happy [fulfill/complete my joy] by having the same thoughts [being like-minded/of one mind], sharing the same love, and having one mind [heart; soul] and purpose [goal; mind]. Wouldn’t it be wonderful if the body of Christ could drop sedition / division / dissension, be of one mind and have a common / united purpose? In my lifetime issues like women wearing pants, open-toed shoes and cosmetics, men wearing beards, people going to the movies or owning and watching television caused division. The above list are mere examples, what a shame that these topics promote sedition/division/dissension! Is God Pleased with Division? Jesus warned, ‘any kingdom (country) divided against itself will be destroyed; and every city or house (household; family) divided against itself will not stand (survive; continue safe and sound).’ Are we a family? Of course, we are and we must learn to stand firm in the truth and stay away from things and people who cause division. Do not allow the sin of sedition to be part of your life. Be blessed my friends, ♥ Tim. 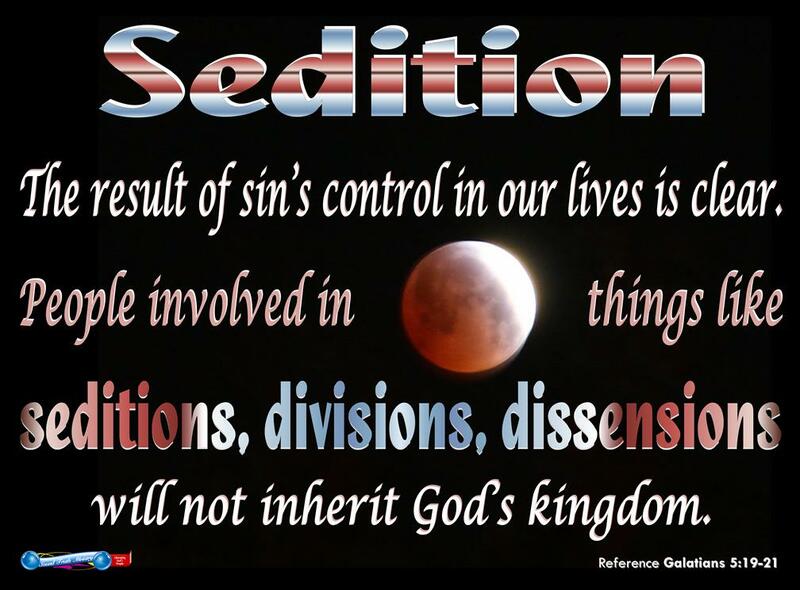 ♥ Question for “sedition”: What issues cause sedition / division / dissension in the church today? Is God pleased? Scripture quotations marked (CEV) are from the Contemporary English Version Copyright © 1991, 1992, 1995 by American Bible Society, Used by Permission. || (EXB) The Expanded Bible Scripture taken from The Expanded Bible. Copyright ©2011 by Thomas Nelson. Used by permission. All rights reserved. || (GW) Scripture is taken from GOD’S WORD®, © 1995 God’s Word to the Nations. Used by permission of Baker Publishing Group. || (HCSB) Scripture quotations marked HCSB®, are taken from the Holman Christian Standard Bible®, Copyright © 1999, 2000, 2002, 2003, 2009 by Holman Bible Publishers. Used by permission. HCSB® is a federally registered trademark of Holman Bible Publishers. I am overwhelmed . (+)..Thank you so much for relief in the bible study passage ..I am forever grateful to be apart of this ministry.. I thank you. In Jesus name I accept and receive the reading of today’s post. May GOD continue blessings you and First Lady Ann..